Taylor-Jensen Fine Arts has the distinct honour of showing a selection of new works by Whanganui-based artist, Mary Mulholland. “A Bouquet of Paintings” is just that: A handful of realistic works that evoke all the senses. These large canvases echo the view one might have while closely examining and even sniffing these delicate blooms. Join the artist on her walk: “There are many things to see on a walk and I am drawn always to walk where flowers are in bloom. Their being goes straight to my soul. In a physical way they give me their knowledge but I always feel especially unable to pass this knowledge on. I see them, I touch them, paint what they look like but the ever elusive communication I cannot impart. So I persevere, never tiring of looking, as this is the instrument I work through. Maybe one day I will see and understand enough to communicate in another way, but for now it’s through their appearance. I just keep looking and wondering. Take yourself along on my journey.” From her first exhibition in 1973 in the Otago Museum foyer in Dunedin from which the Hocken Library purchased one of her paintings; through exhibitions in Christchurch, Queenstown, Auckland, Hawke’s Bay, Dunedin, Whanganui and many other galleries and institutions across New Zealand, Mary Mulholland has always painted flowers! 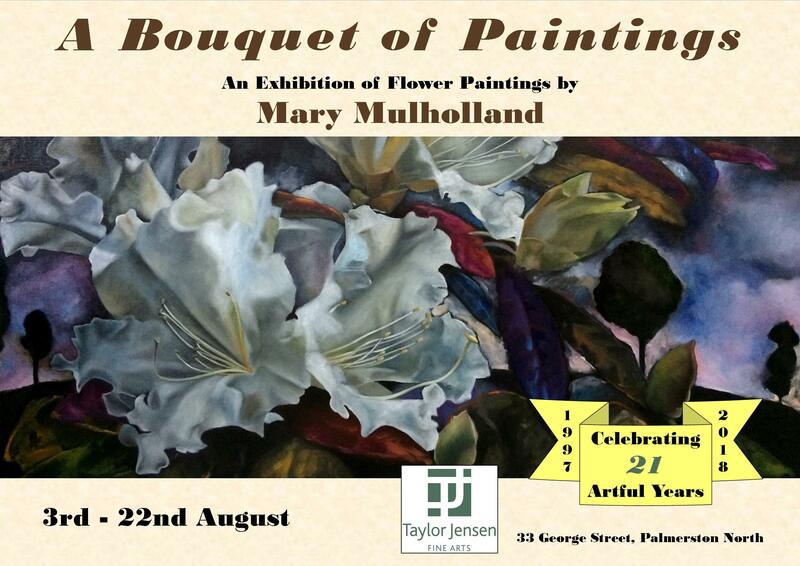 “A Bouquet of Paintings” is Mary’s first exhibition in Palmerston North and her debut at Taylor-Jensen Fine Arts. A visit to her exhibition will be a breath-taking experience. Flowers play a rich and varied role in societies across the globe. From friendly pick-me-ups bestowed on a friend to wedding bouquets to flowers on the coffin at a funeral or as part of a wreath honouring our departed military, flowers are a significant visual symbol, a gesture of love and friendship and often a bright spot in the environment whether inside or out. A reviewer of an exhibition of Mary’s paintings previously wrote: “Mulholland’s work evokes an emotive response…she has made the subject her own, producing paintings that possess a restrained elegance alluding to the profound.” As others have said, Mulholland’s paintings are not just flower paintings but dramatic representations of complex and highly structured blooms. Her subject is altered by dynamic cropping, exaggerated scale and the compression of both the foreground and the background. The image becoming almost abstracted emphasising colour and form. Visitors to her exhibition will see that her works are imbued with a special spirituality that may be imparted to like-minded individuals. ‘A Bouquet of Paintings” will be shown at Taylor-Jensen Fine Arts from 3rd through 22nd August. Mary Mulholland was born in Folkestone, England in 1949 and emigrated with her family three years later. She graduated with a Diploma of Fine and Applied Arts from Dunedin Art School in 1972. Mary has been painting for over four decades and professionally since 2004. Her recent exhibitions have included shows at the Whanganui Community Arts Centre; the Bryce Gallery, Christchurch; Two Rivers Gallery, Cheviot; the Saffron Gallery, Timaru; Centre of Contemporary Art, Christchurch; the Milford Gallery, Queenstown and Dunedin and many, many more. ”A Bouquet of Paintings” is not only an exhibition showcasing an artist’s skill and abilities but also serves in place of real bouquets and floral tributes to help the gallery celebrate its 21st Anniversary. Opened to the public on Saturday 2nd August 1997, Taylor-Jensen Fine Arts—The premier dealer gallery in the Central Districts’—continues a tradition of exhibiting the best artwork by local and regional artists and a selection of work by artists with ties to the Manawatu. Come celebrate our “21st” on Saturday 4th August from 1-3pm at the gallery, 33 George Street, Palmerston North. Mayor Grant Smith will officially cut the cake.